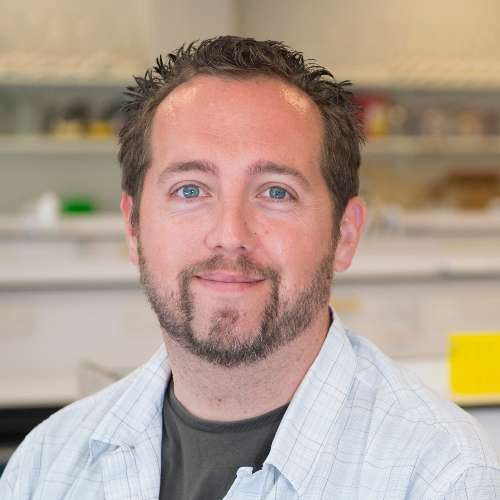 Dr Chris Toseland received a BSc (Hons) in Biochemistry from the University of Wales – Aberystwyth in 2006 then commenced a PhD at the MRC National Institute for Medical Research - London. He received his PhD in 2010 from the University of London. His thesis focused upon the biochemical and biophysical characterisation of DNA helicases. At the end of his PhD, Chris was awarded an EMBO Long Term Fellowship to move to the Ludwig Maximilians Universität – Munich to work on single molecule studies with myosin motors. After 3 years he relocated to the Max Planck Institute of Biochemistry with a research focus on genome organisation. Chris joined the School of Biosciences in 2015 as a Leverhulme Early Career Fellow. In the same year he was awarded a highly prestigious MRC Career Development Award to establish his research group. The presence of myosins in the nucleus is well established but what role they play in the organisation and transcription of genetic information is unclear. For the first time we combine classical biochemical and single molecule assays to provide a quantitative high resolution description of the activity of these nuclear myosins; providing a mechanistic insight into the activity of these proteins. Cook, A., Hari-Gupta, Y. and Toseland, C. (2018). Application of the SSB biosensor to study in vitro transcription. Biochemical and Biophysical Research Communications [Online] 496:820-825. Available at: https://doi.org/10.1016/j.bbrc.2018.01.147. Gene expression, catalysed by RNA polymerases (RNAP), is one of the most fundamental processes in living cells. The majority of methods to quantify mRNA are based upon purification of the nucleic acid which leads to experimental inaccuracies and loss of product, or use of high cost dyes and sensitive spectrophotometers. Here, we describe the use of a fluorescent biosensor based upon the single stranded binding (SSB) protein. In this study, the SSB biosensor showed similar binding properties to mRNA, to that of its native substrate, single-stranded DNA (ssDNA). We found the biosensor to be reproducible with no associated loss of product through purification, or the requirement for expensive dyes. Therefore, we propose that the SSB biosensor is a useful tool for comparative measurement of mRNA yield following in vitro transcription. Fili, N. et al. (2017). NDP52 activates nuclear myosin VI to enhance RNA polymerase II transcription. Nature Communications [Online] 8:1871 (2017). Available at: http://dx.doi.org/10.1038/s41467-017-02050-w.
Myosin VI (MVI) has been found to be overexpressed in ovarian, breast and prostate cancers. Moreover, it has been shown to play a role in regulating cell proliferation and migration, and to interact with RNA Polymerase II (RNAPII). Here, we find that backfolding of MVI regulates its ability to bind DNA and that a putative transcription co-activator NDP52 relieves the auto-inhibition of MVI to enable DNA binding. Additionally, we show that the MVI–NDP52 complex binds RNAPII, which is critical for transcription, and that depletion of NDP52 or MVI reduces steady-state mRNA levels. Lastly, we demonstrate that MVI directly interacts with nuclear receptors to drive expression of target genes, thereby suggesting a link to cell proliferation and migration. Overall, we suggest MVI may function as an auxiliary motor to drive transcription. Lherbette, M. et al. (2017). Atomic Force Microscopy micro-rheology reveals large structural inhomogeneities in single cell-nuclei. Scientific Reports [Online] 7. Available at: http://dx.doi.org/10.1038/s41598-017-08517-6. During growth, differentiation and migration of cells, the nucleus changes size and shape, while encountering forces generated by the cell itself and its environment. Although there is increasing evidence that such mechanical signals are employed to control gene expression, it remains unclear how mechanical forces are transduced through the nucleus. To this end, we have measured the compliance of nuclei by applying oscillatory strains between 1 and 700 Hz to individual nuclei of multiple mammalian cell-lines that were compressed between two plates. The quantitative response varied with more than one order of magnitude and scaled with the size of the nucleus. Surprisingly, the qualitative behaviour was conserved among different cell-lines: all nuclei showed a softer and more viscous response towards the periphery, suggesting a reduced degree of crosslinking of the chromatin. This may be an important feature to regulate transcription via mechano-transduction in this most active and dynamic region of the nucleus. Kang, H. et al. (2015). Crystal structure of Hop2-Mnd1 and mechanistic insights into its role in meiotic recombination. Nucleic acids research [Online]:1-12. Available at: http://dx.doi.org/10.1093/nar/gkv172. In meiotic DNA recombination, the Hop2-Mnd1 complex promotes Dmc1-mediated single-stranded DNA (ssDNA) invasion into homologous chromosomes to form a synaptic complex by a yet-unclear mechanism. Here, the crystal structure of Hop2-Mnd1 reveals that it forms a curved rod-like structure consisting of three leucine zippers and two kinked junctions. One end of the rod is linked to two juxtaposed winged-helix domains, and the other end is capped by extra ?-helices to form a helical bundle-like structure. Deletion analysis shows that the helical bundle-like structure is sufficient for interacting with the Dmc1-ssDNA nucleofilament, and molecular modeling suggests that the curved rod could be accommodated into the helical groove of the nucleofilament. Remarkably, the winged-helix domains are juxtaposed at fixed relative orientation, and their binding to DNA is likely to perturb the base pairing according to molecular simulations. These findings allow us to propose a model explaining how Hop2-Mnd1 juxtaposes Dmc1-bound ssDNA with distorted recipient double-stranded DNA and thus facilitates strand invasion. Soh, Y. et al. (2015). Molecular basis for SMC rod formation and its dissolution upon DNA binding. Molecular cell [Online] 57:290-303. Available at: http://dx.doi.org/10.1016/j.molcel.2014.11.023. Fili, N. and Toseland, C. (2014). Fluorescence and labelling: how to choose and what to do. EXS 105:1-24. This chapter provides an overview of fluorescent labelling of different reactants related to the biochemistry of motor proteins. The fluorescent properties of different labels and the advantages and disadvantages of the labelling methods are discussed. This will allow for a careful selection of fluorescent proteins for different applications relating to motor proteins. Chisty, L. et al. (2013). Monomeric PcrA helicase processively unwinds plasmid lengths of DNA in the presence of the initiator protein RepD. Nucleic acids research [Online] 41:5010-5023. Available at: http://dx.doi.org/10.1093/nar/gkt194. The helicase PcrA unwinds DNA during asymmetric replication of plasmids, acting with an initiator protein, in our case RepD. Detailed kinetics of PcrA activity were measured using bulk solution and a single-molecule imaging technique to investigate the oligomeric state of the active helicase complex, its processivity and the mechanism of unwinding. By tethering either DNA or PcrA to a microscope coverslip surface, unwinding of both linear and natural circular plasmid DNA by PcrA/RepD was followed in real-time using total internal reflection fluorescence microscopy. Visualization was achieved using a fluorescent single-stranded DNA-binding protein. The single-molecule data show that PcrA, in combination with RepD, can unwind plasmid lengths of DNA in a single run, and that PcrA is active as a monomer. Although the average rate of unwinding was similar in single-molecule and bulk solution assays, the single-molecule experiments revealed a wide distribution of unwinding speeds by different molecules. The average rate of unwinding was several-fold slower than the PcrA translocation rate on single-stranded DNA, suggesting that DNA unwinding may proceed via a partially passive mechanism. However, the fastest dsDNA unwinding rates measured in the single-molecule unwinding assays approached the PcrA translocation speed measured on ssDNA. Toseland, C. and Webb, M. (2013). ATPase mechanism of the 5'-3' DNA helicase, RecD2: evidence for a pre-hydrolysis conformation change. The Journal of biological chemistry [Online] 288:25183-93. Available at: http://dx.doi.org/10.1074/jbc.M113.484667. The superfamily 1 helicase, RecD2, is a monomeric, bacterial enzyme with a role in DNA repair, but with 5'-3' activity unlike most enzymes from this superfamily. Rate constants were determined for steps within the ATPase cycle of RecD2 in the presence of ssDNA. The fluorescent ATP analog, mantATP (2'(3')-O-(N-methylanthraniloyl)ATP), was used throughout to provide a complete set of rate constants and determine the mechanism of the cycle for a single nucleotide species. Fluorescence stopped-flow measurements were used to determine rate constants for adenosine nucleotide binding and release, quenched-flow measurements were used for the hydrolytic cleavage step, and the fluorescent phosphate biosensor was used for phosphate release kinetics. Some rate constants could also be measured using the natural substrate, ATP, and these suggested a similar mechanism to that obtained with mantATP. The data show that a rearrangement linked to Mg(2+) coordination, which occurs before the hydrolysis step, is rate-limiting in the cycle and that this step is greatly accelerated by bound DNA. This is also shown here for the PcrA 3'-5' helicase and so may be a general mechanism governing superfamily 1 helicases. The mechanism accounts for the tight coupling between translocation and ATPase activity. Toseland, C. (2013). Fluorescent labeling and modification of proteins. Journal of chemical biology [Online] 6:85-95. Available at: http://dx.doi.org/10.1007/s12154-013-0094-5. This review provides an outline for fluorescent labeling of proteins. Fluorescent assays are very diverse providing the most sensitive and robust methods for observing biological processes. Here, different types of labels and methods of attachment are discussed in combination with their fluorescent properties. The advantages and disadvantages of these different methods are highlighted, allowing the careful selection for different applications, ranging from ensemble spectroscopy assays through to single-molecule measurements. Toseland, C., Powell, B. and Webb, M. (2012). ATPase cycle and DNA unwinding kinetics of RecG helicase. PloS one [Online] 7:e38270. Available at: http://dx.doi.org/10.1371/journal.pone.0038270. The superfamily 2 bacterial helicase, RecG, is a monomeric enzyme with a role in DNA repair by reversing stalled replication forks. The helicase must act specifically and rapidly to prevent replication fork collapse. We have shown that RecG binds tightly and rapidly to four-strand oligonucleotide junctions, which mimic a stalled replication fork. The helicase unwinds such DNA junctions with a step-size of approximately four bases per ATP hydrolyzed. To gain an insight into this mechanism, we used fluorescent stopped-flow and quenched-flow to measure individual steps within the ATPase cycle of RecG, when bound to a DNA junction. The fluorescent ATP analogue, mantATP, was used throughout to determine the rate limiting steps, effects due to DNA and the main states in the cycle. Measurements, when possible, were also performed with unlabeled ATP to confirm the mechanism. The data show that the chemical step of hydrolysis is the rate limiting step in the cycle and that this step is greatly accelerated by bound DNA. The ADP release rate is similar to the cleavage rate, so that bound ATP and ADP would be the main states during the ATP cycle. Evidence is provided that the main structural rearrangements, which bring about DNA unwinding, are linked to these states. Batters, C. et al. (2012). Cloning, expression, and characterization of a novel molecular motor, Leishmania myosin-XXI. Journal of Biological Chemistry [Online] 287:27556-27566. Available at: http://dx.doi.org/10.1074/jbc.M112.381301. The genome of the Leishmania parasite contains two classes of myosin. Myosin-XXI, seemingly the only myosin isoform expressed in the protozoan parasite, has been detected in both the promastigote and amastigote stages of the Leishmania life cycle. It has been suggested to perform a variety of functions, including roles in membrane anchorage, but also long-range directed movements of cargo. However, nothing is known about the biochemical or mechanical properties of this motor. Here we designed and expressed various myosin-XXI constructs using a baculovirus expression system. Both full-length (amino acids 1-1051) and minimal motor domain constructs (amino acids 1-800) featured actin-activated ATPase activity. Myosin-XXI was soluble when expressed either with or without calmodulin. In the presence of calcium (pCa 4.1) the full-length motor could bind a single calmodulin at its neck domain (probably amino acids 809-823). Calmodulin binding was required for motility but not for ATPase activity. Once bound, calmodulin remained stably attached independent of calcium concentration (pCa 3-7). In gliding filament assays, myosin-XXI moved actin filaments at ?15 nm/s, insensitive to both salt (25-1000 mm KCl) and calcium concentrations (pCa 3-7). Calmodulin binding to the neck domain might be involved in regulating the motility of the myosin-XXI motor for its various cellular functions in the different stages of the Leishmania parasite life cycle. Hattotuwagama, C. et al. (2007). Empirical, AI, and QSAR Approaches to Peptide-MHC Binding Prediction. Empirical, AI, and QSAR Approaches to Peptide-MHC Binding Prediction [Online]:139-175. Available at: http://dx.doi.org/10.1007/978-0-387-39241-7_9. Guan, P. et al. (2005). Computational Chemistry, Informatics, and the Discovery of Vaccines. Current Computer Aided-Drug Design [Online] 1:377-395. Available at: http://dx.doi.org/10.2174/157340905774330282. Toseland, C. and Geeves, M. (2014). Rapid reaction kinetic techniques. in: Toseland, C. P. and Fili, N. eds. Fluorescent Methods Applied to Molecular Motors: from single molecules to whole cells. Springer, pp. 49-64. Available at: http://dx.doi.org/10.1007/978-3-0348-0856-9. Toseland, C. (2014). Fluorescence to study the ATPase mechanism of motor proteins. in: Toseland, C. P. and Fili, N. eds. Fluorescent Methods for Molecular Motors. Springer, pp. 67-86. Available at: http://dx.doi.org/10.1007/978-3-0348-0856-9. This chapter provides an overview of different methodologies to dissect the ATPase mechanism of motor proteins. The use of ATP is fundamental to how these molecular engines work and how they can use the energy to perform various cellular roles. Rapid reaction and single-molecule techniques will be discussed to monitor reactions in real time through the application of fluorescence intensity, anisotropy and FRET. These approaches utilise fluorescent nucleotides and biosensors. While not every technique may be suitable for your motor protein, the different ways to determine the ATPase mechanism should allow a good evaluation of the kinetic parameters. Webb, M. and Toseland, C. (2013). Helicases. in: Encyclopedia of Biophysics. Springer, pp. 950-958. Available at: http://dx.doi.org/10.1007/978-3-642-16712-6_463. Acton, S. et al. (2019). The life of P.I.Transitions to Independence in Academia. BioRxiv [Online]. Available at: https://www.biorxiv.org/content/10.1101/571935v1.